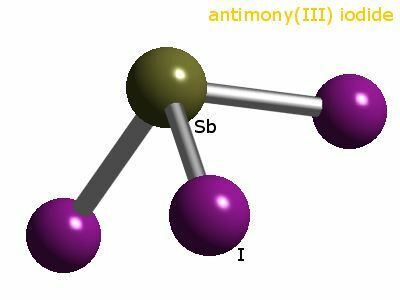 The oxidation number of antimony in antimony triiodide is 3. Antimony(III) triiodide forms in the direct reaction between the elements but the reaction is very violent. The reaction is much more controlled when iodine is added to a boiling suspension of antimony powder in benzene. The product antimony(III) triiodide crystallizes directly out of the reaction mixture as red crystals. The yield is about 80%. Antimony (III) triiodide is red and melts at 166°C. Its boiling point is 400°C. It hydrolyses rapidly in water. The table shows element percentages for SbI3 (antimony triiodide). The chart below shows the calculated isotope pattern for the formula SbI3 with the most intense ion set to 100%.